Despite her small stature (she’s 5’3”), Jennifer (Jenn) Heil is one of Canada’s biggest hopes for a medal at the 2006 Olympics in Torino, Italy. The 22-year-old Spruce Grove, Alberta, native surprised a few people when, after placing 4th in women’s moguls at the 2002 Olympics (just missing the bronze by 1/100th of a point), she decided to take a year off to heal some chronic injuries and attend McGill University. 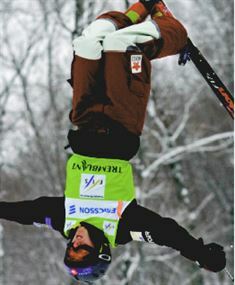 Since her return at the beginning of the 2003-04 season, Heil has been on the podium 15 times, including eight wins, and has won back-to-back World Cup titles. Last season she added one more title—that of World Champion, although this time it was in the non-Olympic discipline of dual moguls. Somehow, in spite of two hectic schedules and a six-hour time difference (I’m at school in France, Heil’s at school and training in Montreal), I managed to catch up with Jenn to discuss her sport, her choices and her life as an Olympic favourite. Ski Canada › Although you now live in Montreal, I’ve heard that you’re quite a hero in Spruce Grove. What’s it like returning home? Jenn Heil › Spruce Grove is a small town so it’s really fun. I went home at the end of last season and my friends threw me a huge party. They picked me up in a limo and took me to Earl’s Restaurant. The entire restaurant—and it’s a pretty big restaurant—was ? lled with my family and friends. I know I have a lot of support from my hometown, but this was overwhelming. SC › What’s your favourite type of course? JH › Steep! It goes back to being a skier and Steep! It goes back to being a skier and JH › being so comfortable on my skis. I like the challenge. The ? atter courses are more about the jumps, but the steeper courses favour people who are good skiers. SC › Are you ever scared to ski down a course? Are you ever scared to ski down a course? If so, how do you get over it? JH › There’s one course that’s intimidating and that’s probably where I’ve had the most success—two wins and two 2nd-place ? nishes. It’s in Inawishiro, Japan. It’s 38 degrees. Normally when you approach a jump, you can see the landing in front of you, which is comforting, but on this course you don’t see anything. It’s like jumping off a cliff, but you have to land with your feet together and start skiing moguls again as if you’re in complete control. I approach it by visualizing the course—but I visualize it being a bit ? atter than it actually is. SC › You decided to take a year off and you’ve said this was the turning point of your career. During that year, did you ever question your decision? JH › It was a big decision, but I knew deep down in my heart that I had to do it. A lot of people thought I was making a mistake, they thought I would lose a lot, but I ended up getting more than I could ever imagine, mentally and physically. I spent a lot of time in the gym, but not much on snow and my skiing still improved. It really showed me the importance of rest. Taking the year off also created a balance in my life. Before I was focused and determined and that helped me get to the Olympics ahead of schedule, but being in a different environment from sport and meeting people at school who had goals in areas outside of sport brought me a new perspective. I was reminded of my love for skiing and the great opportunity I have to represent Canada in international competition after taking time off. SC › Was it different this season going from SC › being the hunter to the hunted? What have you done differently? JH › When I came back from my year off, I just focused on myself. I know a lot of athletes say that, but I didn’t know where I would rank because of my time off. In the ?rst event of the season I tried to just focus on my own skiing and not think about how well I would do. I came 2nd. I’ve stuck to that same plan because it works. Women’s moguls is so competitive that you have to bring your best each day. SC › When you returned from your year off, you decided to go outside of the Canadian team program and hire a personal coach. You obviously do this because you think it helps you, but speci?cally, what difference does it make? JH › There are a few important things it addresses. It has allowed me to stay in school and to control my schedule. That may not sound like a big deal to someone who is reading this, but for someone who spends as much time travelling as I do, it’s really important. This way I can do what I know my body needs, and right now it needs to be in the gym. I don’t need to be skiing in May and June; I need to be building my body back up. I have control over things I know work for me, which I couldn’t do without my own coach. SC › Having your own coach makes you a bit SC › of an outsider within the Canadian ranks. Does this affect you in any way? JH › No. The Canadian national team is one of the strongest in the world, not just for results but also for the way it works together. I still see my Quebec teammates while I’m in Montreal, and I see all of them during the competition season. I think I’m fortunate that we have such great people on and working for the team. They accept that I have my own coach and things don’t really change much. Unfortunately, I don’t have a team to train with all the time, so there’s a bit of give and take. SC › This past season you went into the World Championships as the favourite, but ended up what was, for you, a disappointing 5th place in single moguls (the Olympic event). Does it matter that you were 5th? JH › It matters, every result does, but you have to take what you can from those performances. I skied ?ne, but nothing was special. I felt prepared. Even looking back, I still think I was prepared. I just didn’t have the kick I normally do. I’m working hard this summer to ensure that no matter what the circumstance, I have the ?re and I am ready to explode out of the gate. SC › The day after you were 5th in singles, you came back to win the dual mogul title, defeating your arch nemesis, Norwegian Kari Traa. What did you do to elicit that kind of performance after the disappointment of the day before? JH › Kari Traa [four-time World Champion, 2002 Olympic Champion] has beaten me for the last three years, but I had beaten her once before in ? nals so I knew I could again at Worlds. I was physically drained on the day I was 5th, then emotionally drained after because I had set higher goals. I had to do what I needed to do—which was a bit of venting. I was still at the gym at 8 o’clock that night so I just went right home to bed. I knew I needed all the energy I could get, but when I woke up it was still challenging. The competitions were just hours apart. I built my intensity on each of the dual runs. When it was time to race Kari, I was ready. I just committed. I committed to the point where results didn’t matter. I love skiing against Kari in ? nals— there’s nothing better. You can’t make any mistakes and that motivates me. SC › You’ve said that you try to use your experiences as a learning tool. What did you learn from your experience at Worlds that you’ll take with you into future competitions? JH › Essentially I had to get used to qualifying ?rst and being the last person down the hill. Worlds was the ?rst big event I went into being a favourite. I had to get my head wrapped around that and at the same time I had to learn to let that go. SC › Does being an Olympic favourite put more SC › pressure on you, or are you someone who can block that out? JH › Basically, I feel con?dent. I know where my ability is and I know how much I’ve improved as an athlete. It’s exciting to be in this position. But it’s the Olympics—nobody is going to hand you a medal. You have to ? ght for it. I feel like I’ve progressed so much, but I still have more to work on this summer. SC › Who’s going to be your biggest SC › competition this season? JH › There are numerous women from all different countries who are strong. Kari is the seasoned veteran and you can’t count her out. The young Americans are good, too—they have so much depth. Hannah Kearney, the World Champion, and Shannon Barkhe, if she comes back strong, are both factors. And Nicola Sudova of the Czech Republic was really consistent last season. SC › So, do you have any mogul advice for readers who aren’t world champions? JH › It’s a mindset. Keep your head up and stay forward. You have to put your fear aside.